Puja Yagya conducts Vedic Yagna for marriage that lets you have successful, fulfilling, blissful marrid life. We include Pundits who are well aware of all the rituals and Yagnas, which are explained in Vedic scriptures for having love-full, happy married life. We also conduct Yagna for you that helps you in getting your best suited soul mate, and if in case your marriage are getting delayed then, Yagna conducted by our Pundits will also remove all the obstacles. Solutions for other match making issues or incompatibility in Love marriage are also effectively solved by the conduction of Vedic Yagna for marriage, which is aptly completed by our Purohits. Including Vedic procedures in marriage is very important, as holy mantras create an aura of absolute positivity around the soul mates during conduction of all the Wedding rituals. 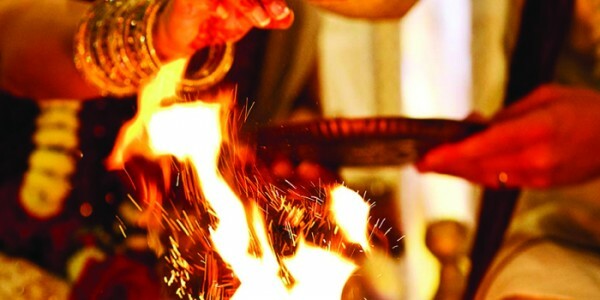 We ensure Vedic accuracy in all the Yagnas related to marriage and some of the noticeable Yagnas for marriage are: • Yagna for Love & Compatibility • Yagna for Blessed, Successful and Happy Married Life • Yagna for Removing Obstacles in Love cause by third party • Yagna for Better Mutual Relationships between Partners • Yagna for Removing problems caused in marriage due to Sexual Dysfunction • Yagna for Customized Marriage Requirements • Special Yagna for Peace in the Families if Bride & Groom, etc. Alongside all these Yagnas, we also conduct Marriage Yagna as per your particular requirements. For any such needs, you may contacts us and our Pundits will analyze all your needs, and then they will suggest best Yagna for you as per the explanations given in Vedas. For any query or doubt, you can call us anytime as our telephonic consultancy services are absolutely free and we are always ready to help you in the best possible way. Our Gurukul trained pundits will give you advices and will clear your all the doubts related to Marriage Yagna in the most fitting and fulfilling manner. Features of Puja Yagya’s Yagna for Marriage: • Puja Yagya provides customized Yagna for Marriage services as per your convenience and that means; if you like to conduct marriage Yagna at your preferred places then we can conduct that aptly with full Vedic accuracy. • We at Puja Yagya comprise our own Yagna-Shalas (Yagna Place) and Hawan Kund (Sacrificial Fire) that have sacred blessings of respective gods & goddess where we conduct Yagna for your marriage. • We display live streaming of Yagna for marriage conducted at our place in our Yagna Shalas. During conduction of Yagna, we ensure complete Vedic accuracy with full transparency. • We have Pundits who have attained the Vedic knowledge from the reputed Sanskrit Gurukuls & Universities established in India, and hence with us absolute Vedic satisfactions are guaranteed.